One of the responsibilities of being a homeowner (or renter – depending on your lease) is keeping your property clear of snow and ice. As winter sets in, it can feel like a never-ending task to keep your sidewalks clear and walkways free from ice. Fear not. We've put together a short list to make sure you have everything you need to combat the woes of winter walkways. 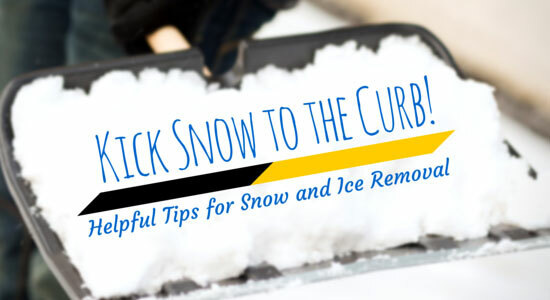 Check out tips for removing snow and ice from around your home. First and foremost, before you even scrape the shovel across the snow, make sure you do a quick stretch to loosen up your muscles. Using the proper form – lifting with your knees and not your back – can keep you from a lot of pain later. 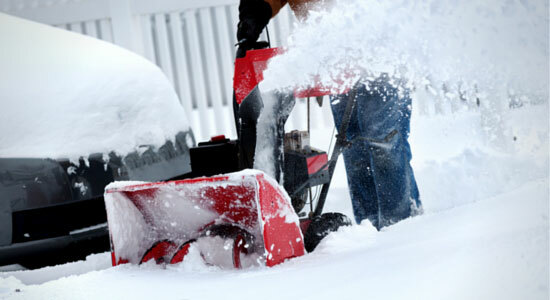 Shoveling snow requires a remarkable amount of stamina and physicality, so make sure you're prepared when you set out. Take breaks and stay hydrated if you can. It may be freezing outside, but you can still overheat. The best defense is layering your outfits and knowing when it's time to take a break. Not all shovels are created equal. If you do any amount of gardening or yard work, you're probably familiar with that section of your local hardware store. There are many different tools for many different jobs – snow removal included. Some shovels are built to push snow. These typically have C-shaped blades and are great for clearing fluffy snow from walkways, driveways, and decks. Other shovels – either plastic or aluminum – will have a flatter blade that's coated with a non-stick finish. Don't be tempted to overload these shovels when lifting and moving snow – your back will thank you later. If the snow starts to stick to your shovel blade, spray it with cooking spray to ensure the snow slips right off. You might not realize it, but shoveling snow should come with a plan. Don't do more work or move more snow than needed. Before you pick up that first pile, make sure you outline the moves you're going to make, so you don't end up shoveling yourself into a corner. 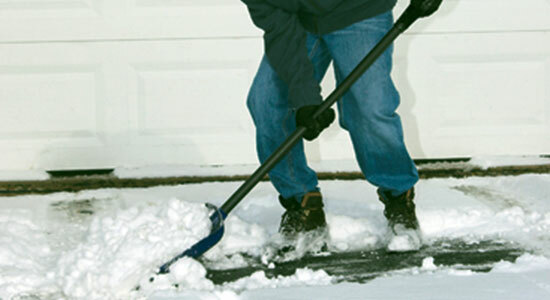 If your driveway is rectangular, we'd recommend shoveling a line around the outside. Then you can start from the center, pushing the snow towards the perimeter, and lifting it once you've hit the clearing. Always have a plan to where you'll put the shoveled snow. There's nothing worse than having to shovel a pile of snow to get to another pile that needs to be shoveled. This is something we can't stress enough. Many people will wait until the snow has finished falling, because they think, "Why do the job more than once?" While we understand that logic, you'll only be making your shoveling duties more difficult. If you're able to clear a lighter batch of snow a few times over the course of a day, rather than all at once, you'll be saving your body from a heavy load of work. In many cities, snow must be cleared from public sidewalks in a certain amount of time. Otherwise, the authorities could fine you. For instance, in Pittsburgh, you have 24 hours to clear your sidewalks and driveways after a snowfall. Do you have a large area to clear? Use a snowblower if possible. Make sure that there's at least an inch and a half of accumulation first. Otherwise, it might not be an effective way to move the snow. Before starting your snowblower, spray the chute with silicone to keep snow from sticking or jamming the opening. Also, when you're finished snowblowing, let your machine run for an extra minute or two to dry out. Always be careful when using a snowblower and never attempt to clear a clogged chute while its still running. Two things are important when talking about de-icer. It's not a substitute for shoveling, and there are many different kinds for different purposes. Just like finding the right shovel, you'll want to find the right de-icer for your home. Make sure you choose the best option for your home and climate. It could make all the difference when preventing a slip and fall accident. The best way to prevent slips and falls on your property is to be proactive with snow removal. Don't wait until it's piled up. Make sure you keep your pathways clear for guests. We hope you stay safe this winter, but – as always – if you're ever injured in a slip and fall accident, call us for a free consultation. We're available any time.